You know what makes me laugh about Passover? When I was growing up (in a very Italian-Catholic home,) my mother was always quite excited when Passover was imminent because matzoh would hit the shelves in the supermarket. And my grandmother was even more excited. I remember Grandma visiting once during Passover and gifting us 3 boxes of Streit’s matzoh that she received with a coupon at Shop Rite. We didn’t need any matzoh, of course, because my mom had already used a similar coupon at Pathmark and stocked up. But we were happy to have it, because once Passover was over, matzoh would be nowhere to be found. But let me tell you, I don’t love it. None of us in this house does. But pickings were always slim during Passover, unless one resorted to boxes of cake mix made out of sugar, preservatives and matzoh meal. Fast forward to 2014 when blanched almond flour has become as common as quinoa (which is ok to eat during Passover believe it or not.) So I have been able to enjoy delicious, “normal” baked goods which just happen to be grain-free. Just by using almond flour. Game changer! 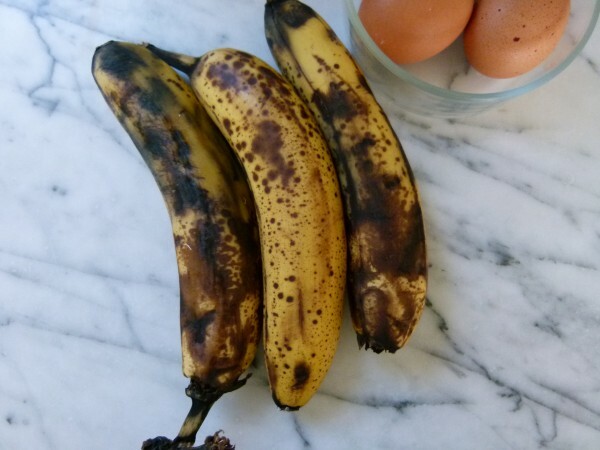 A few years ago I posted a recipe for some delicious almond flour muffins with banana, chocolate and chia seeds. 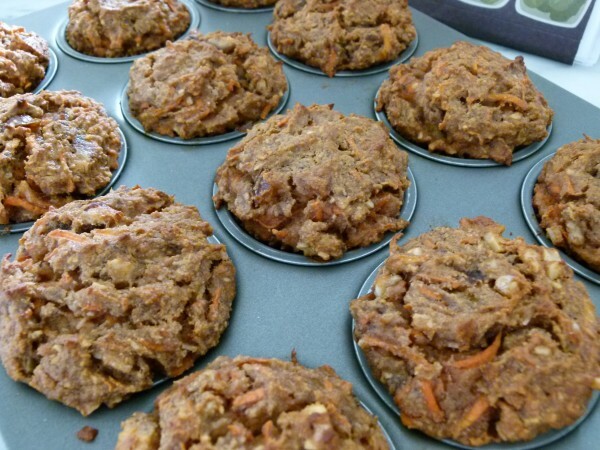 I will for sure make a batch or two of those next week, but I will also be making these amazing banana-carrot-coconut muffins. I found this recipe in Andrew Weil’s True Food cookbook and made a few adjustments to make them even more healthful. 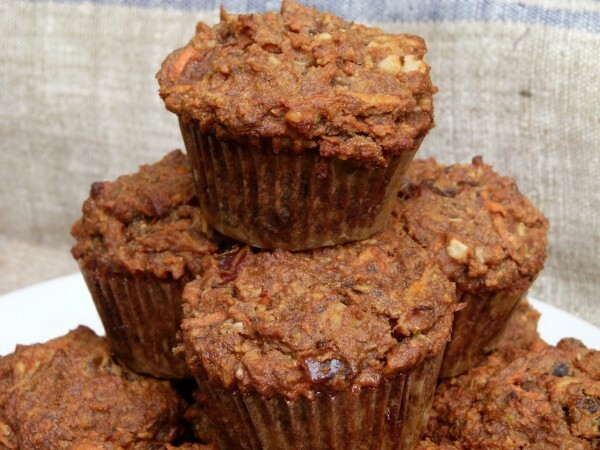 These muffins are a great cross between carrot cake and banana bread and have a nice, subtle sweetness. I actually make one batch as a 2-layer cake for the seders and spread my vegan frosting in between. I’ll make another batch and freeze them for breakfasts and lunchboxes, since I think these can serve as a meal-in-a-muffin. Ironically, my mother still buys matzoh, although the options are far more interesting than they used to be including spelt, onion and even gluten-free. For me, I’ll enjoy Passover much more with these muffins! 2 cups blanched almond flour (not almond meal) I use Honeyville. 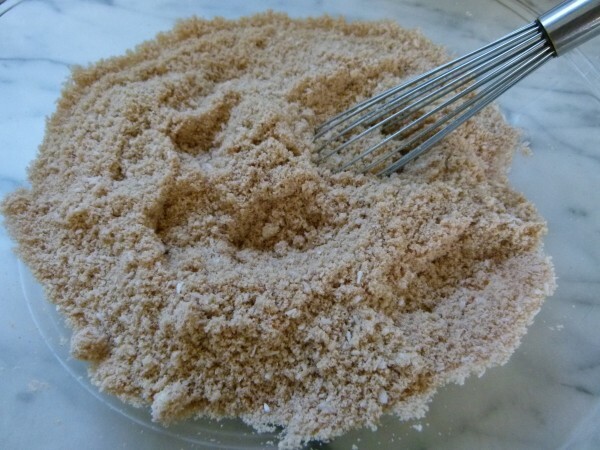 In a large bowl, mix together the almond flour, baking soda, salt, cinnamon and coconut. In another bowl, whisk the eggs, bananas, melted coconut oil, honey, vanilla and vinegar together, making sure that the oil is well incorporated into the other ingredients. Stir the wet ingredients into the dry ones. 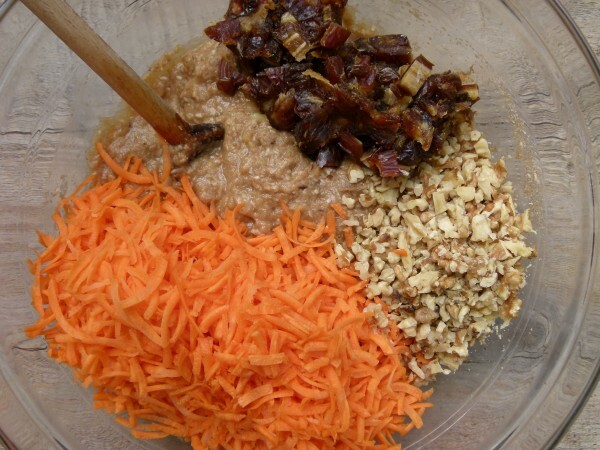 Fold in the dates, carrots, and walnuts. Divide the batter among the muffin cups. You will fill the cups to the top since these muffins don’t rise very much. Bake for 40 minutes, until golden brown or a skewer inserted into the center of a muffin comes out clean. (Since there is no actual flour, the muffins will not rise significantly.) Cool in the pan or on a wire rack for 5 minutes, then turn out the muffins onto the rack and let cool to warm or room temperature. This recipe calls for blanched almond flour, which is much finer and lighter than almond meal. Bob's Red Mill "almond flour/meal" is not fine enough. 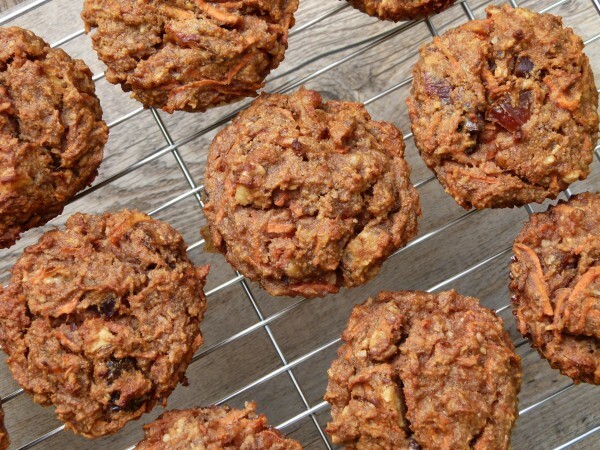 You can use almond meal in this recipe, but the results will be heavier and coarser. Followed this recipe exactly, my house smells fantastic, the muffins are EXACTLY what I was looking for. Not too sweet, but sweet enough to be a real treat. And very nice flavour and texture. Very nice combination of flavours. And that’s exactly the kind of treat I like to create – not too sweet, but just right. Thanks, Shelley! Great Muffin! This recipe is a go to while we are eating Whole30. 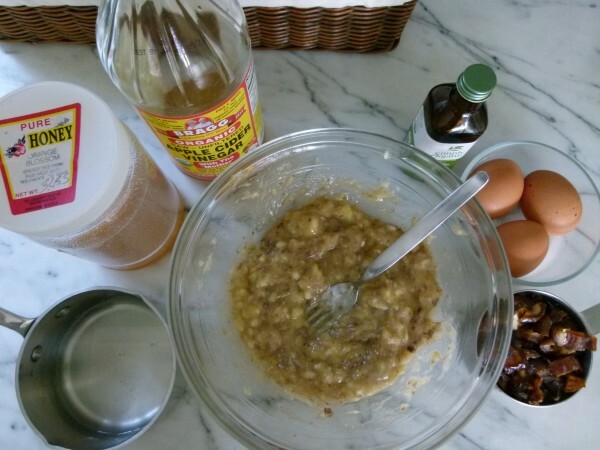 I use date paste vs honey, raisins vs dates and I save some chopped walnuts to sprinkle on top for added crunch. So good. I’m going to try with zucchini in place of carrots next. I bet zucchini will work really nicely in this recipe! Made this as a double layer cake with cream cheese frosting for easter and unfortunately passed out leftovers. Wish I would have had more to take home, because this is amazing! I can’t wait to make it again! Well, now you have an excuse to make it again! Hi. I cannot tolerate almonds. 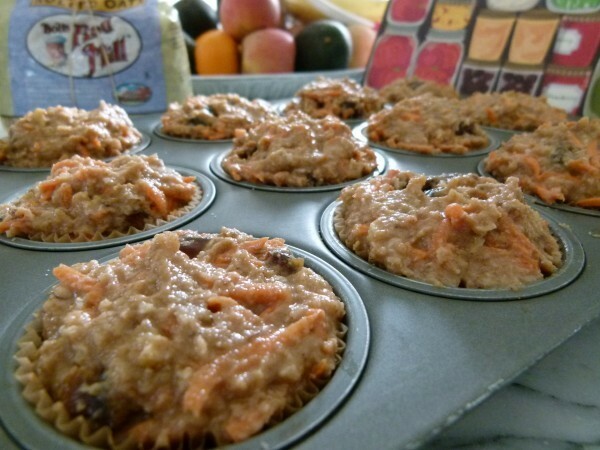 Would I be able to make banana carrot muffins with grd. pecans or walnuts for Passover. thanks for your help. I haven’t tried substituting another nut flour in almond flour recipes, but if I were going to, I would try a pecan meal first. Bob’s Red Mill makes one. My daughter really wants me to make carrot cake muffins so I’m looking for a recipe. She’s GF/DF/ and allergic to nuts – complicates things! Do you think this recipe could work with coconut flour instead of almond? Thanks for all the fabulous adaptable recipes!!! Unfortunately, you can’t sub coconut flour for almond flour and I don’t like to use all coconut flour in recipes because you need to use so many eggs and then it tastes so egg-y. 🙁 If I were you, I would just take a good GF flour blend like King Arthur and mix it with GF oat flour and some xanthan gum and make my carrot cake recipe. Use coconut oil and you’re good to go! These are fantastic and the house smells amazing! I was wondering how do you freeze your baked goods? Do you individually wrap them? What kind of container do you use? Thanks! Thanks! So are aluminum foil and ziploc bags not harmful (leach chemicals) if they are in the freezer? Aluminum leaches when it is heated and when something acidic (like citrus juice or tomatoes) are stored in it. Plastic does leach, but mostly when it’s heated, something acidic or fatty is stored in it. I wouldn’t worry about a few muffins. Hi can you use whole meal spelt flour? Unfortunately, you can’t sub grain flours for nut and coconut flours — they all behave very differently. Check out my carrot cake and banana bread recipes and see if you want to add coconut flakes and chopped dates to either of those! 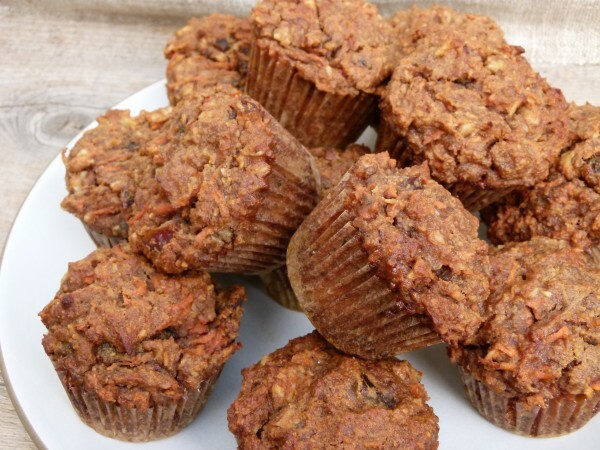 These muffins are fantastic…so moist and flavorful without the grease and sugar! Thanks for another great recipe. Aww, thanks Mia. I agree — delicious! These came out SO delicious!! Thank you for making my Passover a bit more bearable!! And for a muffin recipe without the dreaded potato starch that seems to be in every Passover dessert! Passover desserts have had a lot of help from nut flours. Glad you enjoyed them! if my muffin tins are stainless steel( without a coating) i don’t need the liners, right? You don’t need the liners, but you do need to grease the tins before filling them. Another thing to spruce up our Passover sedar! Thank you. If using teflon coated muffin tins (which is possibly a no-no), do I need to use muffin papers? Any way to make these vegan? 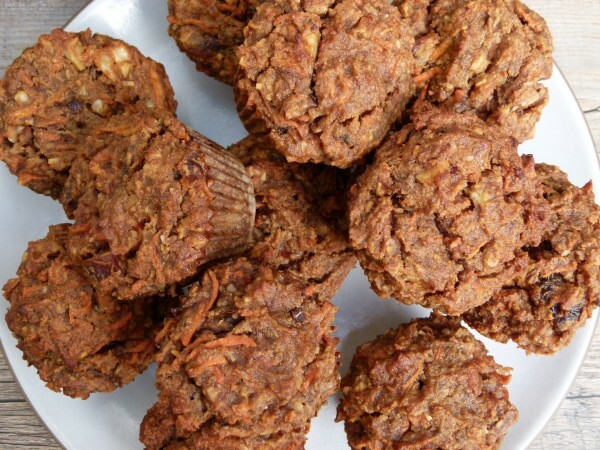 I haven’t tried to make a vegan version of these muffins, but I would try this: sub equal amount of maple syrup for honey and try 3 flax eggs in place of the regular eggs. 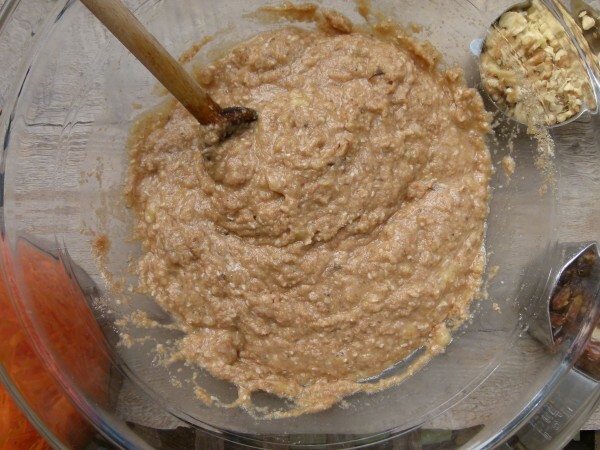 To make 3 flax eggs, stir together 3 Tablespoons of ground flax meal with 9 Tablespoons of warm water. Allow to sit on the counter for 15 minutes and then add to the batter. I wouldn’t put the flax egg mixture in a blender. Would love to hear if you try this! If I have pre-shredded carrots is there a measurement instead of the number of carrots? Good question. I’m going to guess and say 3/4 cup. These look great! Will regular honey suffice if one does not have raw honey on hand? Thanks! Great! One last question: do you think I could substitute coconut flour or an ancient grains gluten free flour for the almond flour? Many thanks! You’re welcome! Unfortunately all those flours work differently. Sometimes I supplement almond flour with a little coconut flour, but I don’t enjoy using all coconut flour. It’s really absorbent and you need to use so many eggs. Grain flours don’t contain fat like almond flour, so you would need to add more fat. Which gluten-free ancient grain flour did you have in mind?